The Splatoon 2 Global Testfire is almost upon us, and Nintendo of America has now confirmed that the Treehouse team will be hosting a live broadcast in which they play the online demo. 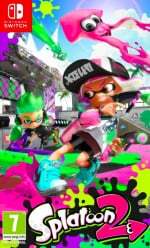 A similar thing happened with the equivalent for Splatoon, which certainly helped generate some hype. It'll be the first session that's streamed live online. As a reminder, the following are the dates and times for this online demo. We'll be hosting a live blog and chat for that Treehouse stream while naturally playing the game ourselves. We'll see you then! Hoping for a release date to be announced during the stream, although Nintendo always holds their cards close to their chest. Still waiting for an ARMS release date, and that comes out sooner! @Nik-Davies You know...I was thinking exactly that! I'll catch it on YouTube later. @Nik-Davies Those of us that can't play will be getting a pretty good deal out of it! I'll be tuning in for sure! Oh no! Almost forgot about this! I feel bad for everyone who work in the morning. They have to go to bed early and leave early for works. And I don't think times before 8 o'clock in the morning and as well time after midnight is considered prime time for stress testing. @Flanktwo The online services are in a "trial" period right now because the entire service is not fully operational yet. Matchmaking is working, though. In other words, online services are free until sometime in the fall. Oh not this stupid thing again. Wake up at 4 am to play an hour long demo! Yaay Nintendo! I forgot the clocks go forward this weekend, so it'll basically be 3am for us Brits. @Flanktwo What are you talking about? Full online goes live in the Fall. So I have been hearing reports of very poor Switch wi-fi connection. Anyone own one and have an opinion? If it's legit, how do you think it will impact events like the global testfire? @Mainsaile It is hugely noticeable for me. I can't even keep it with my other consoles in the same room; I have to use the TV (for the dock style play, I mean) that's closest to my router. It is unfortunate because I prefer the former room, but I'll live. I'm out of town for the weekend, but I'll see if I can use a hotel Wi-Fi for it. @Flanktwo Free online launched at launch. Plenty of games already use it.